Following the issue of the last of the dateless registrations, suffix registrations introduced a new feature to number plates - the year identifier. Search suffix registrations - just pick three letters, a number and one suffix letter. The suffix registration system ran from 1963 to 1982. Prior to 1963, registration marks were dateless - not carrying any kind of easily recognisable year identifier. Suffix registrations made the age of the vehicle known by attaching a year identifying letter to the end of the number plate. This began with 'A' in 1963, and a new letter was issued every subsequent year until 'Y' was reached in 1982. After 1982, when the suffix letters had been exhausted, the system changed and prefix registrations were introduced. Were all the Letters of the Alphabet used for Suffix Registrations? Some letters were not used in the suffix registrations system; for example I, O, Q, U and Z were never issued. 'I' and 'Z' were reserved for Northern Ireland, 'O' was thought to too closely resemble zero, 'Q' was used but only on vehicles where their date of manufacture was in doubt, and 'U' appeared too much like 'V' for use on suffix registration plates. What do Suffix Registrations Look Like? Suffix registrations consist of three letters followed by a one, two, or three digit number with a year-letter identifier at the end. The three letters identify what would have been the original area of issue for the registration. 'ABH', for example, originated in Buckinghamshire, 'CHN' would suggest Darlington. Paired with the age identifying letter (the suffix), it would originally have been possible to identify the age and area the vehicle displaying the registration originated from - combinations like CGO ***B, CGO ***H, CGO ***S and CGO ***X were issued in 1964, 1969, 1978 and 1981 respectively in London. What Year Were Suffix Registration Letters Issued? This table shows the year of issue for each suffix letter. Are Suffix Registrations Good for Investment? 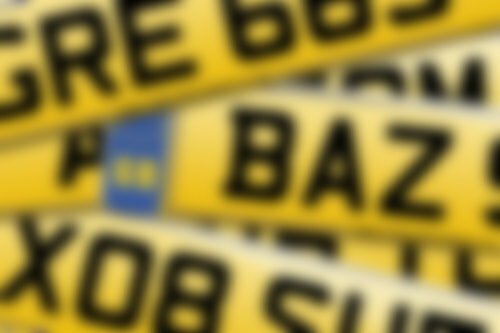 Because the format of suffix registrations presents three letters first, suffix registrations can offer some very attractive choices as private number plates. Short names, such as PAT and TOM, are highly sought after - so much so that when the DVLA began selling prefix marks they stopped the issuing of reg that spelled names like these as replacement age related marks. Suffix registrations represent excellent opportunities for both enjoyment and investment - as cherished number plates providing an interesting alternative to prefix registrations as well as a cheaper alternative to dateless names. Absolutely unbelievable speedy service, and very efficient and helpful when I called in for advice. Can't recommend highly enough.